Spring Steelhead on the Manistee River located on the west side of Michigan, is one of the best places in the Midwest as well as the world for steelhead fishing. Thousands of anglers search for steelhead on Michigan's rivers and streams in the spring looking for one of these trophy rainbows. The Lower Manistee River located below Tippy Dam, has about 30 miles of river for anglers to look for great spring steelhead fishing. 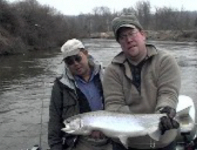 The spring run of steelhead on the Manistee River starts in March. Fish from the summer run and fall runs of steelhead on the Manistee River will spawn first. Fresh fish from Lake Michigan will continue to enter the river and spawn into the early portions of May. The early portion of the run is known as the pre-spawn time period and starts in Late February and will continue during the month of March. Spring steelhead is a loose term when talking about pre-spawn fish, because most days the weather is still like winter. This can provide some tough fishing conditions, but also some great fishing! Early Fish love eggs, and so egg patterns are the number # 1 fly to fish for fresh pre-spawn steelhead. During warming trends, aquatic insects start to become active and will also provide a great food source for steelhead. Small stonefly nymphs, caddis larva, and Hex nymphs will also be productive. The second stage of the run is the spawning stage. During the spawning stage fish are hot and cold to taking a fly. Fishing below spawning steelhead can produce fresh steelhead looking to spawn, but still willing to feed aggressively. Most of the spawning will occur when the water temps are above 40 degrees. The middle portions of April will see a great mix of pre-spawn, spawning, and Post spawn fish. Post spawn fish are known as drop-backs, as they will slowly drop back to Lake Michigan. The post-spawn or drop-back steelhead will start to actively feed again. Swinging streamers for these fish works will in later April and early May. Leech patterns with a little flash of copper, green, and red seems to work best, as well as imitations of Chinook salmon fry, which also work well for trout. Spring Steelhead fishing on the Manistee River can be done by anglers with all skill levels. The use of floating lines, sinking lines, chuck & duck or deep water nymphing techniques will all produce Spring Steelhead. Spring Steelhead fishing on the Manistee River can be done by wading if the water levels are not too high. Water flows on the Manistee River will stay around 1500 cfs for winter flows, but will rise to levels of 3000 cfs or more during the Spring Steelhead season due to melting snow and spring rain showers. The use of a boat will allow anglers to cover more water during the spring run of steelhead on the Manistee River. The water on the Manistee River will get very colored at times during the spring run of steelhead. Rivers such as the Pine above Tippy Dam will create color from clay and silt during the spring run-off and can make it hard to see into the river. The use of a good guide service will help to put you onto fish. A guide is out everyday, as knows where and what to fish to make your day of Spring Steelhead fishing productive.